If you’re wondering about Messenger as an Ad Destination, you’re in the right place. Overview: Facebook has released new capabilities for ads, and if you log in to your Facebook Page, you might see a graphic like the one above. Facebook is encouraging advertisers to try these new ads, and send clickers into Messenger. From the conversations I’ve had with brands and agencies, I’d guess a lot of people have questions about how this might work. Sending the clicker into Messenger is only half a solution. Once the user is in Messenger, then what happens? Let’s take a step back and talk about the Facebook Messenger Platform/API. This Platform was released in April 2016 and allows anyone with a Facebook Page to build automated Messaging campaigns. The possibilities are endless. Essentially a brand can talk directly to customers and do this in a manual or automated fashion. The release of Messenger Platform generated a ton of buzz and developers got the hint. Within 6 months there were about 34,000 applications developed on the Messenger Platform (these applications are sometimes called bots). 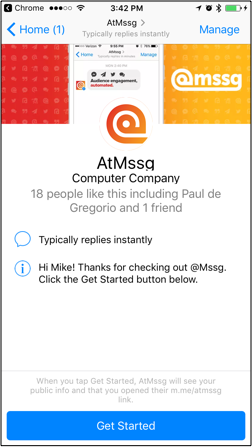 Although developers jumped to build on the new it platform, users haven’t been as fast to use these new Messenger interactions. Of course this must have been expected. Messenger as a Destination in ads is Facebook’s answer to that question. The ground rules for Messenger are clear: a user must message in to start the conversation. A brand cannot simply blast out (spam) messages to anyone. Typically a user can message in from a few different paths. Organic: An organic incoming message would see the user open Facebook Messenger, search for a brand and then send in a message to start the conversation. Messenger interactions are new for users and this organic messaging behavior might be confusing. Except for some special circumstances, I wouldn’t expect users to do this all that often; the platform is just too new. Most brands would need to find better ways to get users to message with their page. Linking In: A link into the Messenger Page is the next, best way for a brand to drive messaging. 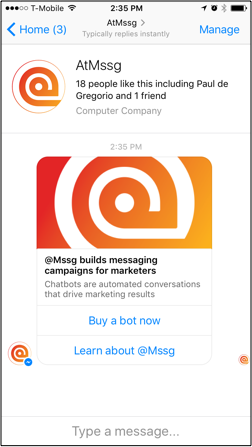 Facebook released short links that connect a user directly to the brand’s Messenger Page. More recently Facebook released short links that can include referral parameters. For easier conversations, I call these deep links into Messenger. With a deep link, the brand can link the user to their Messenger Page and also track where the user is clicking from. This allows the brand to trigger a specific conversation based on where the user is coming from. For instance, if Home Depot has a Messenger App that helps people find an item in the store… when a user clicks from the page in Spanish, they will go directly into the Spanish speaking conversation. These deep links are important, as they capture a little intent as the user is starting the conversation. Facebook Ads: For many obvious reasons, Facbook has bestowed special capabilities into Facebook Ads and it makes the ads the strongest entry point into a Messenger conversation. Specifically, when a user clicks on a Facebook Ad where Messenger is the destination, the user is sent into Messenger and they receive a message. So when clicking an ad, the user doesn’t need to click the Get Started button. Facebook offers two options when Messenger is the destination of the ad click. The first option is called Message Text. When the user clicks the ad, a copy of the ad, along with a sentence or two that the adds will be sent to the user. In this scenario the user would respond and the application/bot would be handling the conversation moving forward. The second option when Messenger is the Destination is a Structured Message. The Structured Message sends a Generic Template, which is what Facebook calls a card with an image, text and up to 3 buttons. In my opinion, this is the best user experience, they can click the button and activate a conversation with the brand. It would seem to reason that Facebook had this plan all along. Release the API so that brands and developers could build on Messenger. The next step is to release ads into Messenger in order to help developers and brands get results from the Messenger applications they’ve built AND create new ads, that drive new interactions unique toFacebook. Interestingly, the next step of the plan is also clear. Facebook has released (although they aren’t promoting) ads inside Messenger, called Sponsored Messages. If a user messages in once, the brand can buy a Sponsored Message, to activate that person in the future. It’s almost like retargeting, except with a message. The biggest loose thread for me is use cases. 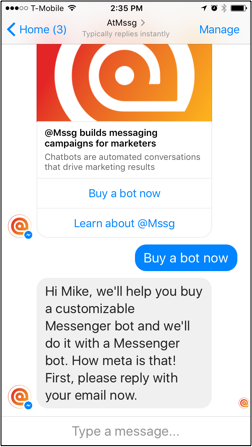 Since launch Facebook has coupled messaging with the idea of AI and customer service. The ecosystem bought in, and everyone envisions a world where you message in to Comcast to ask about your bill rather than call the 800 number. For some reason, AI would work on Messenger and you’d get a better, faster, cheaper answer via Messenger. This seems to be where everyone is looking, although it feels a little off. The two problems are that 1)AI doesn’t exist and 2)No company is buying ads in order to drive customer service interactions. When the user clicks a button it begins the conversation. With Facebook promoting Ads that direct users to Messenger, it appears that marketing department are most likely to benefit from the Messenger Platform. So we built a platform to help. With @Mssg we feel the most valuable action for messaging is to drive marketing conversations and outcomes. We’ve built a platform that powers messaging campaigns and drives the same action that you would previously send a clicker to a page to complete. The value of messaging is that the response rate to messages on the phone is much higher than the response rate on a mobile web page. If you have any questions about Messenger as a Destination, or you’d like to chat, leave a comment below or you can use our Messenger application to tell us your thoughts privately. Just click here, and then click the Get Started button on the page to give it a try. http://m.me/atmssg. Quick Update: Here is a written explanation from Facebook. At the bottom they confirm that Messenger As a Destination Ads won’t be shown to people on mobile, that don’t have Messenger installed. https://www.facebook.com/help/162893084149464?__mref=message_bubble If you target to only display ads on mobile, the ad should only show to people with Messenger installed.